NETWORK UPDATE: SHARK TANK gained 0.1 in final numbers, as did THE AMAZING RACE and the 2d hour of the HAWAII 5-0 season finale. CABLE HIGHLIGHTS: ESPN’s NBA PLAYOFFS doubleheader crushed Friday cable at 2.22/2.12, with NBC Sports Net’s NHL PLAYOFFS way behind at 0.55/0.35. In between was Adult Swim’s CHILDRENS HOSPITAL, up 0.04 to 0.63. BERING SEA GOLD (Discovery) was up 0.08 to 0.63, with lead-out UNEARTHED up 0.08 to 0.32. History’s HANGAR 1 rose a tick to 0.34. 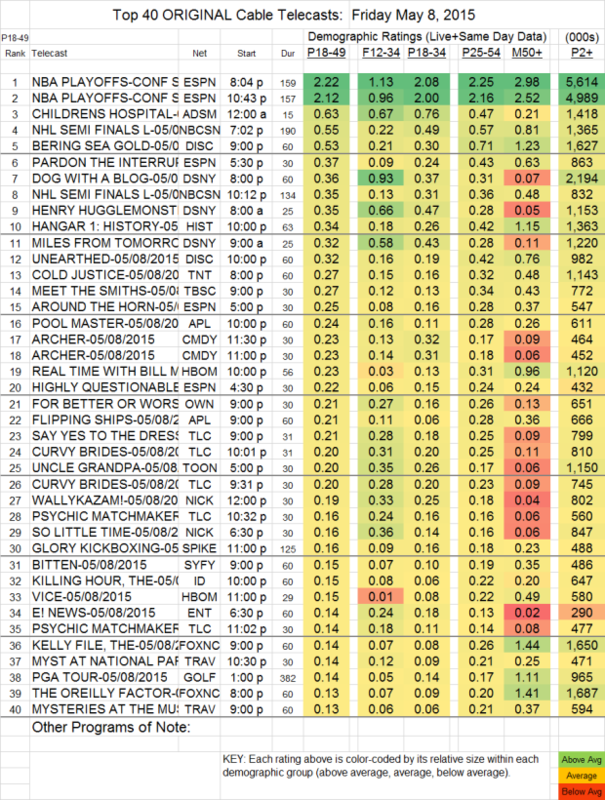 COLD JUSTICE (TNT) lost 0.02 to 0.27. MEET THE SMITHS (TBS) was at 0.27. On HBO, REAL TIME WITH BILL MAHER was down a hundredth to 0.23, and VICE fell 0.06 to 0.15. FOR BETTER OR WORSE (OWN) dropped 0.01 to 0.21. On Syfy, BITTEN was up 0.04 to 0.15, and LOST GIRL held at 0.12. THE GRACE HELBIG SHOW (E!) lost last week’s 0.01 gain and returned to 0.09. COMEDY BANG BANG (IFC) sank by half and had to be rounded up to reach 0.01, with 14,000 total viewers. The 9PM run of IMPACT WRESTLING (DAM) fell 0.02 to 0.08, and total viewers were down by 60K to 358K, with households down more minimally to 0.24/278K. The 11PM run added 0.02 in 18-49s, 105K total viewers, and 0.07/80K households.